It was a long time ago–perhaps the late 1960’s or early 1970’s. 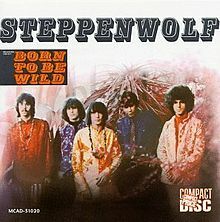 It was the wrong time, the wrong place and the wrong evening to be holding a pair of tickets to a Steppenwolf concert. I attended college in the deep south in the mid-1960’s. In itself, there’s nothing strange about that. The problem was that I was from Upstate New York—I was a Yank. Keep in mind that the march in Selma had taken place only a few months before my arrival. The Freedom Riders (northern agitators) were a recent memory. The first view I had of my college town was that of a KKK member (in full pointed cap and gown) directing traffic to a rally. I found out soon that the 100 years since the end of the Civil War was like yesterday to many of my classmates. I was looked upon with suspicion because I was one of only a few Yanks attending college there at the time. Louisiana, I learned, was actually two states. South Louisiana was Cajun country. Mostly Catholic, the population of the lower half of the state loved a good time–beer, shrimp and the jazz of Bourbon Street. It was very different in the northern half of the state where my college was located. This was the heart of the “Bible Belt” south. Strict morality and antebellum southern charm was the norm. It would be fair to say that in the time I was there, I could sense a lack of “liberal” attitudes and a strong Baptist belief in the evils of good old rock and roll. Somehow, the very popular group, Steppenwolf, got itself booked in the local civic center. And I had tickets. Their major hit and theme song, “Born To Be Wild”, was to become the key song to “Easy Rider”. I couldn’t wait to rock out to “Get your motors running…” A civic center full of youths were of the same mind. I knew I was in for a rocking’ evening. Then, only a few songs into the show, things went wrong. The group was in the middle of another of their hits, “The Pusher”. When John Kay, the lead singer, sang the words: “Goddamn the pusher man”. The authorities in charge of the arena decided that such a curse word was not allowable. They seemed to have missed the whole point of the song which is to curse the pusher–curse the evil. All they had to hear was “Goddamn”, and that was enough. We were all on our feet when the music stopped. The band looked around, searching for a wiring error. The stage lights went up. Someone had pulled the plug, literally, on the concert. Amid the confusion and yelling, the band left the stage. Someone in a dark suit, looking like a cross between Pastor Bill and a funeral director, took the mike and mumbled something I couldn’t understand. The house lights were all on. The audience was not liking what was happening. The shouting grew louder. The tension grew. The anger of the ticket holders rose. Finally, after about 10 minutes into this fiasco, John Kay and the band returned to the stage. What he said into the mike, I can still hear to this day. Then they went full-tilt into “Born To Be Wild”. The house went crazy. I wasn’t rocking to the music. I just stood there and looked at the cheap seats behind the stage and on the upper level. These teenagers were dancing in the aisles—the scene was something like you’ve seen in the film “Woodstock”. I felt a profound sorrow for these kids—they only wanted to rock out and dance. They weren’t pot smoking hippies—they were just young teenagers dancing on their seats, starved for some of the ’60s magic. They looked to me like they were born to be wild…if just for a few minutes. This entry was posted in Holding onto the Past, Memories and tagged 1960s, Baptists, Born to be Wild, Cajuns, censorship, Freedom Riders, KKK, Louisiana, Selma march, Steppenwolf, yank agitators. I remember that night well! Too bad not much has changed down here after all these years.